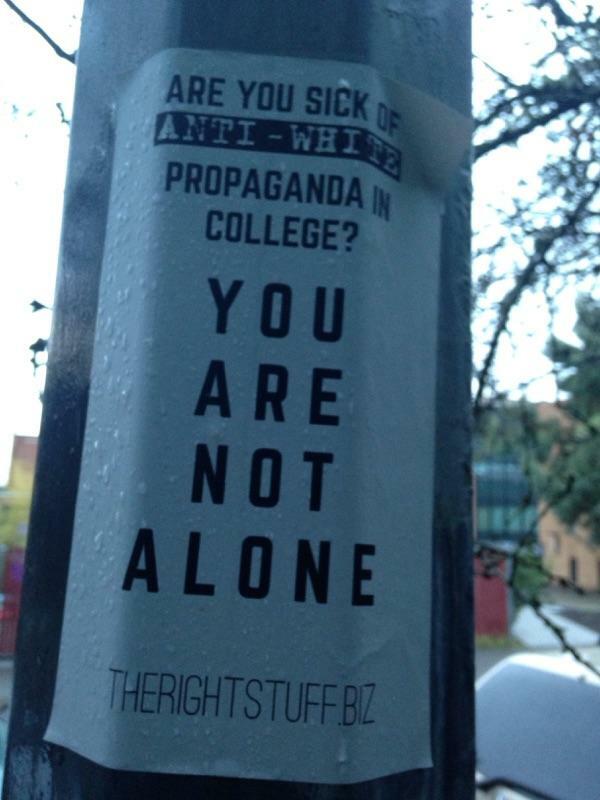 White Supremacists under the banner of “The Alt-Right“, a term made popular by Richard Spencer, are attempting to recruit sympathetic student-body members of local college campuses by the use of flyers adorned with flashy graphics and hate rhetoric. They use images depicting their irrational fear that the “white race” is under attack and facing extinction. These flyering incidents do not seem to have been organized events, rather they have been carried out by a few emboldened racist idealogues sourcing their propaganda from Neo-Nazi websites promoting flyering actions. There is now a nationwide mobilization scheduled for April 23 calling for a mass distribution of racist flyers that appears to be well organized and is being promoted by Neo-Nazi groups such as Identity Evropa, American Vanguard and their sympathizers who are broadcasting information and sharing propaganda flyers ready for printing. Based on recent attacks, it is believed by local organizations, at least in the mid Atlantic region, that college campuses such as George Washington University, Towson University, University of Maryland College Park as well as the Baltimore County campus are likely targets. White Supremacists plan to cover college campuses, community centers, and high traffic areas with racist, sexist, anti-Semitic and anti-immigrant posters and stickers (examples below). These hateful groups are operating on multiple chat sites to organize this event. This planning is being monitored by multiple, diverse anti fascist groups including but not limited to Mid-Atlantic General Defense Committee of the IWW, Baltimore Antifascist Community Defense, One People’s Project, NCP and Anti Fascist Action. We are concerned about the members of hate groups using misinformation and propaganda to recruit and organize. It is necessary that the public is aware of the alt right’s “Day of the Flyer” as we have recently observed an increase in, not only racist and hateful propaganda but also hate related incidents, shootings and other attacks. In the interest of community safety and defense, students and their school administrators should be vigilant and raise awareness prior to April 23 and during the morning hours after 2am. Campuses and surrounding communities should be on alert of this pending assault. The Battle for Berkeley on April 16th was a clash between the Alt Right and the growing anti-fascist movement that is uniting the left in response to the threat of white nationalism. Helmed by Lauren Southern, the event brought in right-wingers, racists, militamen, and Alt Right ideologues together in the heart of Berkeley, California. The confrontation became heated as fights opened out across the city, and Antifa took entire areas of town while the Alt Right terrorized locals. Within that, Identity Europa, the youth-oriented Alt Right fraternal organization helmed by Nathan Damigo, was a major player. Identity Europa has taken a lead in organizing on college campuses, especially at the University of California at Berkeley, where they have made connections with the College Republicans. 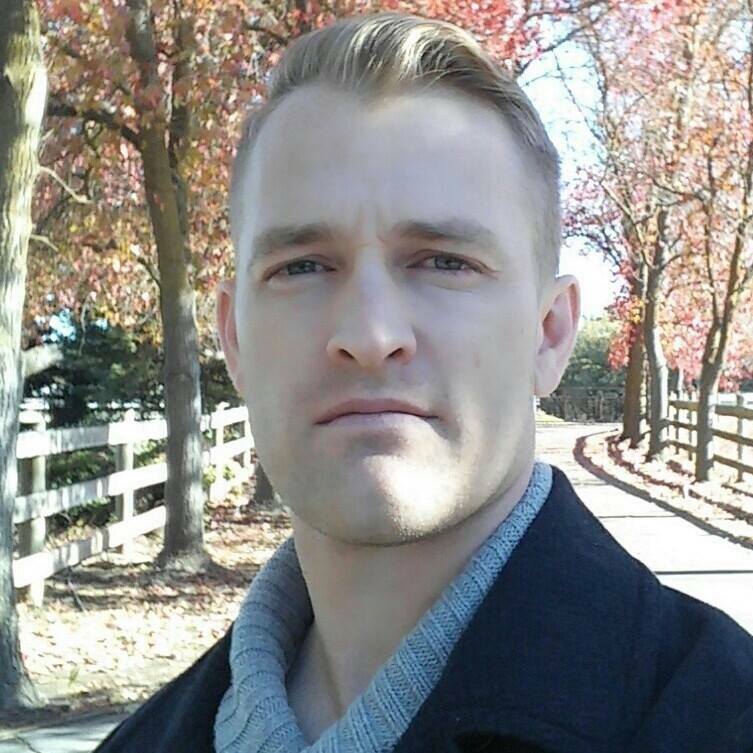 Damigo, who served several years in prison for a hate crime against a middle eastern cab driver, was further radicalized in prison and is now a right-hand man to people like Richard Spencer. According to the video we are posting below (which is posted by what appears to be an Alt Righter), Nathan can be seen punching a woman in the face in a brutal assault. Will he face charges for this? The police were reportedly siding more often with the Alt Right on the ground, something not surprising given the history of the Golden State’s police force. At an event with open neo-Nazis and white nationalists, it is no surprise that someone like Damigo felt he could just assault women without reprisal. 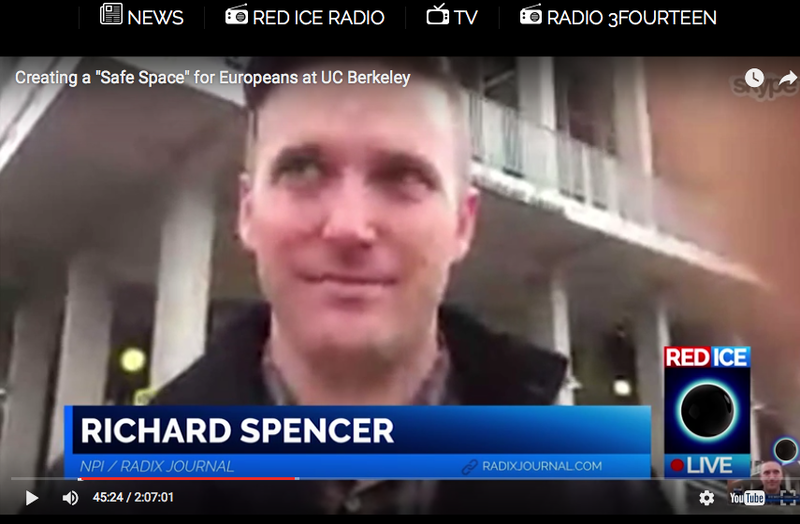 Richard Spencer has been trying to make the Alt Right a campus-based movement for a couple of years now. There are a number of reasons for this, one of which is that they have seen growth from white male Millenials at state colleges in groups like Identity Europa. Another is simply that state schools have a legal necessity to host people like Spencer, despite his ideology, as long as they can foot the bill. This is what happened at the disaster of an appearance of Spencer last year at Texas A&M, where the three simultaneous protests were so large that it was akin to a football event. There were two protests immediately announced, including one starting at 6pm and ending at 9pm, coinciding with Spencer’s speech. The Facebook page for this has since been taken down. While liberal anti-fascist groups like the Southern Poverty Law Center have said that students should refrain from counter-protesting, large student blocks plan on confronting the event, as well as anti-fascist groups from the region, including Atlanta Antifa. There will also be an event called “Hashing it Out,” which will address the threat presented by Spencer and the Alt Right during the event, for those who wish not to protest. This is an important event to oppose publicly because it is the continuation of the only avenue of actual organizing and recruitment the Alt Right really has: college campuses. This is not just an event for them to share their views, but an opportunity to organize and grow racialist organizations of the area, and for them to exploit the history of Jim Crow in the South. Expect to see not only Alt Right figures and organizations like Identity Europa, but allso KKK and neo-Nazi groups as well. Public opposition is the only thing that works, and that is why it will take a groundswell of numbers to cancel the event and set the standard that students will not allow their universities to be used to prop up white nationalism. In the last month or so, there’s been a rise in fascist and racist propaganda seen throughout the Seattle area. There’s been wheatpasted posters, stickers, and even graffiti in Ballard, the University District, the Central District, Beacon Hill, Leschi, South Lake Union and Capitol Hill. There have also been reports of posters and stickers seen on the campuses of Evergreen State College in Olympia, WSU in Spokane and WWU in Bellingham. The propaganda belongs to at least three different groups, although we cannot be sure of how many people are actually involved. Those groups have been identified as American Renaissance, The Right Stuff, and Identity Evropa. American Renaissance (AR or AmRen) is a publication that describes itself as a “race-realist, white advocacy organization” that was published in the 1990’s by New Century Foundation, a white separatist organization. AR has been active since 1990, and is listed as a white supremacist organization by the Anti-Defamation League. They have been wheatpasting and writing graffiti in Sodo and the Central District, messages like “AR will vote from the rooftops” and “Vote Trump 2016” with their emblematic AR logo accompanying it. The Right Stuff is an alt-right blog and podcast that seems to have situated itself comfortably between respectability-aiming fascist politicos and meme-filled internet culture. 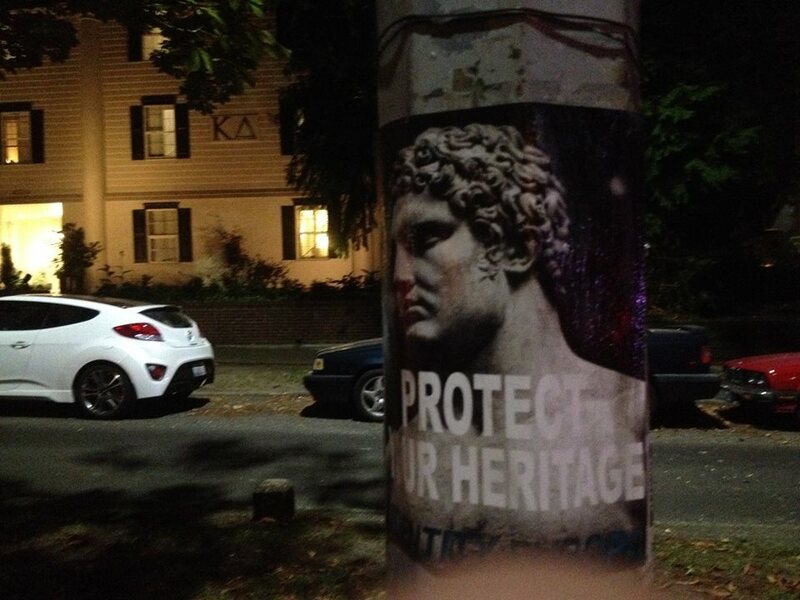 Their wheatpasted posters have been seen in the UD, the CD, Leschi and Sodo, and consist of a link to their website along with slogans like “Looking for solidarity?” “White Pride Worldwide” “White and Unapologetic, Rediscover White Identity.” They seem to be friendly with Identity Evropa, both of which have hosted each other on their own podcasts. Identity Evropa posters and stickers have been seen in Ballard, South Lake Union, Capitol Hill, the UD, and as far south as Beacon Hill. This group seeks to shed the violent imagery and language that most racists and fascists are given, in favor for a respectable and presentable academic approach to uplifting and emboldening a so-called white European identity. One does not need to dig deep however to see them for what they really are; racist ideologues. It is incredibly important to make sure that any kind of propaganda by these racist/fascist organizations are immediately disposed of or covered up. We cannot let them successfully have any space without some resistance on our part. Stay vigilant! Their propaganda is sometimes coded in strange symbology that doesn’t seem outright racist or fascist at first, but can be easily seen if you know what to look for. Carry a fat marker or small spray can with you when you walk around the city. 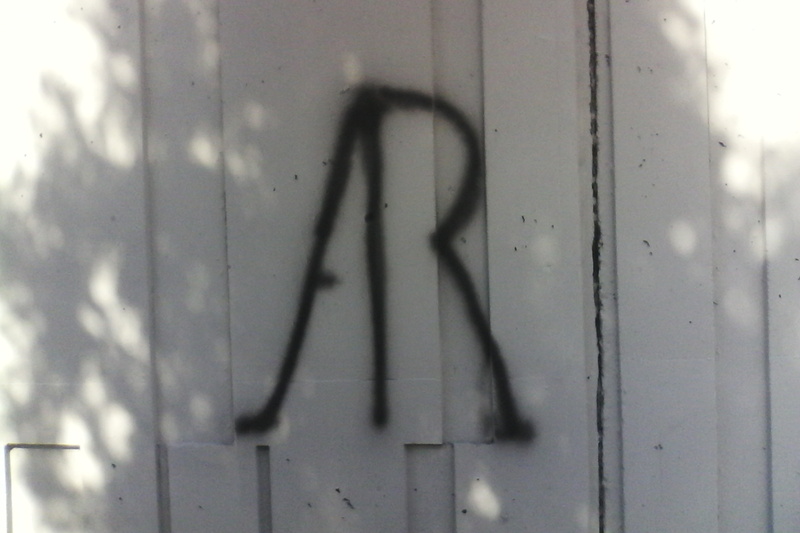 If you see any posters, graffiti, etc that belongs to or might belong to one of these groups or a sympathizer, take note and please emailantifa206 (at) riseup (dot) net so that we can continue to document and keep a record of their work and organizing.